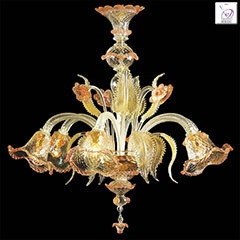 Murano glass chandelier Il Supermarket, your italian mall for Murano glass chandelier, mirrors, sconces and more. 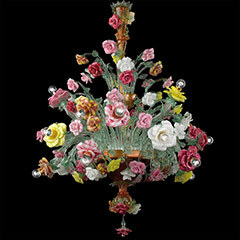 You want to buy a real Murano glass chandelier? Looking for a fair price, a factory price? Would you the most complete and wide range of chandeliers so you can choose the one that suits for your home, for your restaurant or for your hotel? Then you are at the appropriate site, we offer you all this at amazing prices. 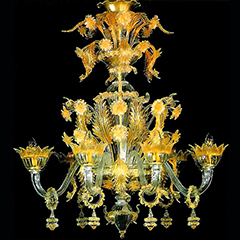 The quality of the glass, the experience of our Murano glass Masters, the fantasy shapes and colors of Venetian chandeliers the opulence of Rezzonico chandeliers and much more. Come to visit our foundry and see firsthand how we model the glass. All our products are handmade on specific request of our customers: colors, dimensions and lights will be as you wish. 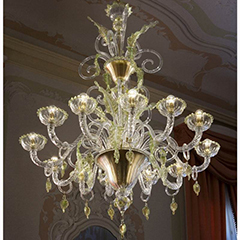 Ineffable beauty, unique and unrepeatable in each of his creations: the classic chandelier of Murano glass. Masters of the present, with centuries-old techniques, handmade glass artworks that will live forever. 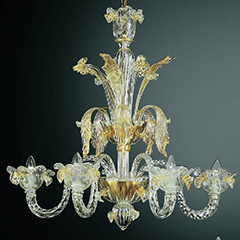 The chandeliers in Murano glass of this series is originated in the Rezzonico chandelier created especially for the Palazzo Rezzonico in Venice. The decorations and the works is full of tiny all work performed by hand by master glassmakers. 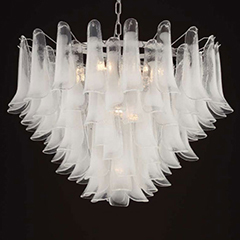 Our Master blown-glass will manufacture (handmade) your personal Murano glass chandelier from your project. 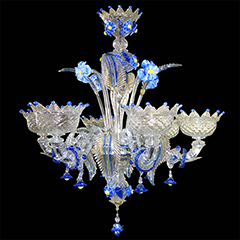 We create tailor-made Murano glass chandeliers for casinos, hotels, restaurants, shops and private villas. Special page for bargain chandeliers. 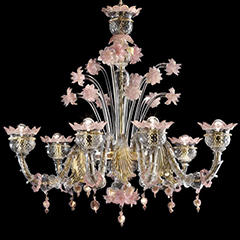 Amazing prices for authentic Murano chandeliers, not in stock but also these handmade on Customer order. 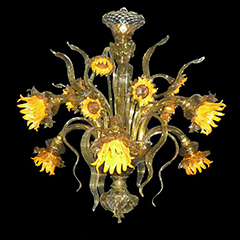 Iron glass Murano chandeliers are perfectly handcrafted as antique artwork made with gold or silver, chrome or black structure and Murano glass in a variety of colors. The dream to have their elegant and incomparable house. 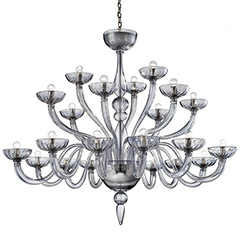 The Murano chandeliers are the true piece of art that can embellish Your house in an elegant way. The Murano glass is used by ancient durations. It has a thousand year-old history. This glass was built in a special way and the technique to manufacture and is passed down by generation and generation. Today the Murano chandelier it's once as before always with the same techniques of The Murano chandelier is not only an object of light but is a perfect work of art. This chandelier is a result of creative and long trial. The technique used in to create these chandeliers is completely unique and unrepeatable. The Murano chandeliers is completely done to hand. Then when you are buying a chandelier memoirs that you are buying a piece of art created by master blown-glass artisans of master with the maximum care and passion. The purest form of glass has mixed with the best natural colors. 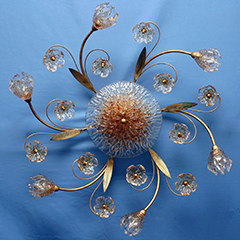 Murano glass is not only uses for chandeliers but also wall sconces, table lamps, mirrors and ceiling lamps.